The next personality type we will discuss today of the 16 personalities identified by the Myers-Briggs Type Indicator is action-oriented, outgoing, and dramatic ESTP. Also known as “The Entrepreneur,” about four to ten percent of individuals exhibit an ESTP personality type. 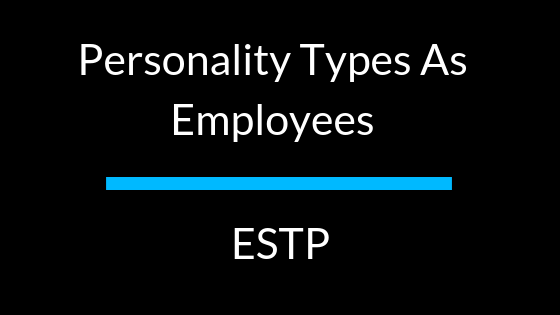 ESTP’s are Extroverted, Sensing, Thinking, Perceiving. They are very outgoing and thoroughly enjoy spending time with their wide circle of friends and acquaintances. Instead of looking at the big picture, ESTP’s tend to focus on the details and are more interested in the here-and-now rather than the future. They like to keep their options open and tend to stay away from anything that requires too much planning. They are also highly objective and make logical decisions. Highly competitive, spontaneous, and great at influencing others, Entrepreneurs are easy to spot in any workplace. They love to tackle problems and share their stories about their solutions once complete. Adaptable by nature, they can make nearly any situation more interesting. They are resourceful, energetic, and obtain strong interpersonal skills. How should the be managed? The most challenging position for Entrepreneurs to work in is an entry-level position. While they can exercise control and restraint on their terms, it is challenging for Entrepreneurs to follow others rules and regulations (they honestly hate it). Because Entrepreneur personality types are known for their improvisation, experimentation, and quick thinking, they will quickly become bored and frustrated if they have to keep their qualities in check and report to their supervisor for every single thing. That being said, Entrepreneurs know better than most that no risk equals no reward, so they will happily avoid menial, mundane tasks in favor of something more exciting in hopes it will catch someone’s attention. Rather than climb the ladder and get ahead by reliability, quiet helpfulness, or seniority, Entrepreneurs push themselves forward by force of will and personality in a well-handled predicament.